My twin brother is getting married! Unfortunately, since the wedding is taking place in Hawaii (his fiancée’s home state) this September, I will be too pregnant to attend. I can’t tell you how bummed I am that I will not be at the wedding, but I will be there in spirit (also via Facetime). And since I won’t be at the wedding, I was thankful to have the opportunity to shower the happy couple with love at the bridal shower my sister, sister-in-law, and I co-hosted over the weekend. I can’t remember the last time I gave a twin brother update, but he and his fiancée (Kristin) recently moved back to Florida. My brother started a fellowship program in Jacksonville and Kristin accepted a position as an attending at a local hospital. They’ve been back for a little more than a month and we’ve already got to see them twice. It’s nice to have both of them so close, and I can’t begin to tell you how thrilled my parents are. There was a point during the party when my siblings and I happened to all be sitting next to each other and my mom ran to grab a photo to take a photo. “My babies! All together again.” Cue the tears and group hug. Since the bride and groom will be saying “I do” in Hawaii, we thought it would be fun to do a luau theme. We covered my parent’s back room (aka the “party room”) with lots of bright colors, grass skirts, leis, and flowers. I actually love the way it came out. For drinks we had an assortment of sodas, iced tea, lemonade, and punch (recipe HERE <- 100% recommend! It was good!). We kept the food simple with a build-your-own sandwich bar complete with veggies, condiments, potato salad, and coleslaw. For dessert we had cupcakes that we spruced up with some drink umbrellas. I know everyone has their opinions on playing games at showers, but I personally think they’re fun. And since Kristin hasn’t had a chance to spend a lot of time with friends and family in Florida, it was a good excuse for everyone to learn a little bit more about her. I did a little googling and created a questionnaire for how well the bride and groom know each other. I collected Josh’s responses in advanced and asked Kristin the questions at the shower (letting her know of Josh’s answers as we went along). It was pretty fun to see how both of their answers compared and everyone was dying from laughter by the end. Next, we played the purse game. 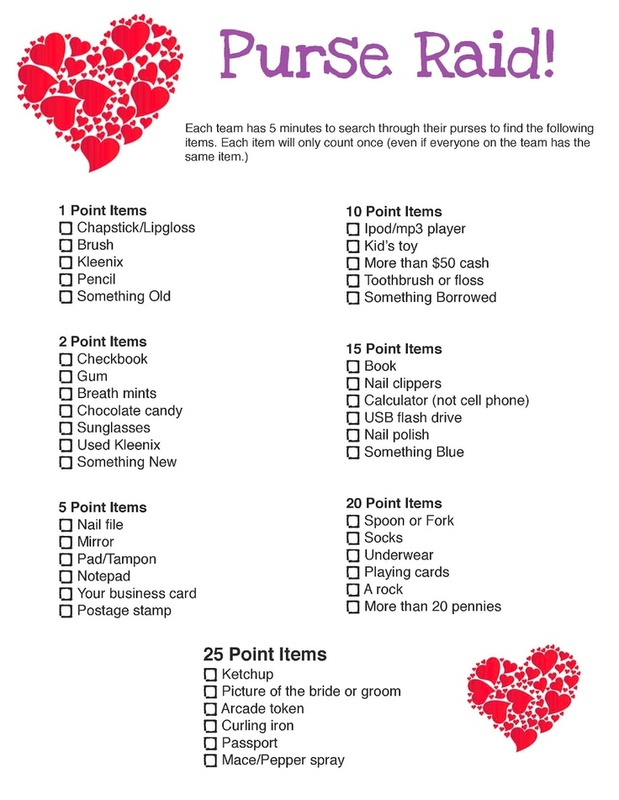 I followed THIS LIST and called out certain items and the points associated with them. If the person had the item in their purse, they got the points. This is always a fun one to see who’s a bag hoarder. The party concluded with presents and story telling. After the party, the boys headed to downtown Orlando for my brother’s bachelor party, while the girls had a girls’ night with pizza and a movie (Magic Mike XXL, anyone?). It was a great Saturday filled with lots of family and love. Such a cute theme!! So sad you can’t go but so great of you to throw such a great party for them! And how great your all in one state! My sisters and I are in one state now and my parents LOVE it! What a great theme! I love it and the cupcakes are absolutely adorable with the little umbrellas! Such a cute party! Also, SUCH a cute dog!! Love the theme and a wedding in Hawaii sounds absolutely amazing- so sad you cant go but nice that you can help celebrate them before the big day! Looks like a fun shower! Also, your future sister-in-law is an attending at a hospital, not an attendee. Just an FYI. Not meant to be rude. That’s awesome! Welcome to Jax! (that’s where I live too) Hope they love it here! That’s a great way to celebrate! Looks like a fun time!